What are the Enrolled Agent Exam Pass Rates? As a tax expert considering the enrolled agent designation, you probably have questions about the Enrolled Agent (EA) exam (officially called the Special Enrollment Examination or SEE). If so, you’ve come to the right place for answers. 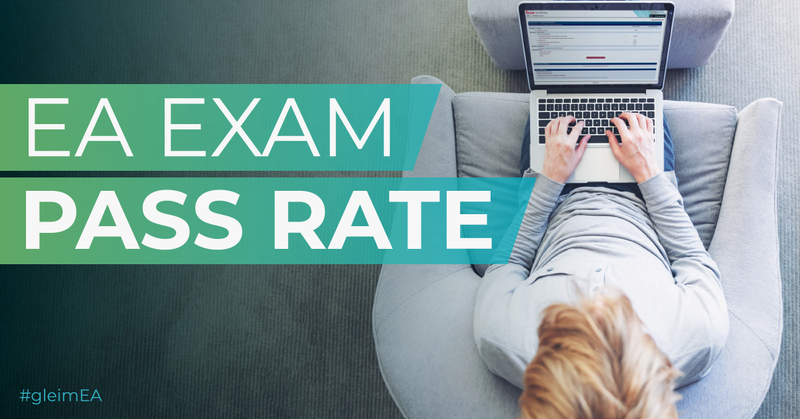 In this blog, we’ll look at the latest Enrolled Agent exam pass rates, consider what they indicate about the difficulty of the exam in the future (especially in light of the coming exam changes), and talk about how to pass no matter the pass rates. This table provides the average pass rates for each part from the last three years. Compared to other professional accounting exams, these pass rates are high. The most current average EA exam pass rate is a strong 71%. The testing center that administers the exam, Prometric, advises against reading too much into the pass rates because candidate populations for the exam parts differ greatly. With variations in candidate populations and other factors coming into play, we cannot assume the pass rates tell us which part is harder than the others. Instead, the topics covered will be the biggest indication as to which exam part will be the most challenging for you, as your current knowledge determines how much you have yet to master. While Part 1 currently has the lowest pass rate, that was not the case just three years ago. At that point, Part 1 had average monthly pass rates reaching 80%, which positioned it in second place among the other exam parts. However, Part 1 passing percentages have experienced a sharp drop as of late. For the last two years, these figures have planted themselves in the area between 50-70%. 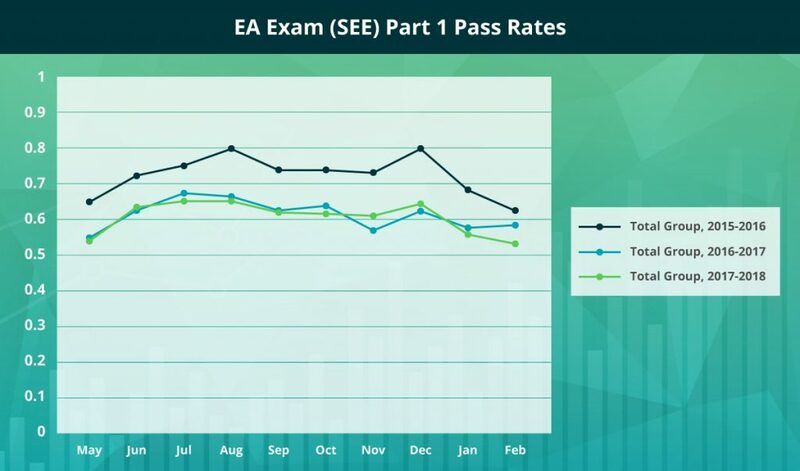 The recent Part 1 pass rates have been as much as 15% lower than those of 2015 and are now just 3% lower than the average Part 2 pass rate of 2018. The Part 2 pass rates are a bit more consistent from year to year than those of Part 1. 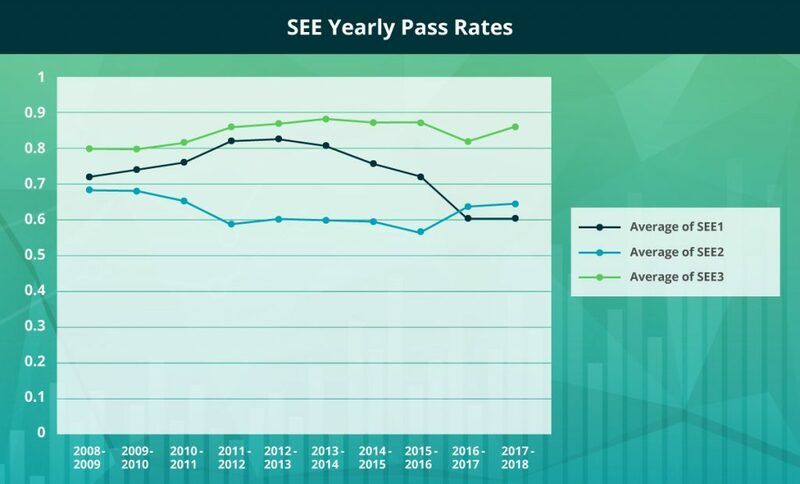 The year 2015 saw the lowest Part 2 pass rates, 16% lower than the Part 1 pass rates for the same year, but Part 2 has been recovering ever since. The passing percentages from 2017-2018 have stayed well within the 60-70% range. The Part 3 pass rates have not only been more consistent than those of Part 1 and Part 2, but they’ve also been quite a bit higher. Though the 2016-2017 testing window saw the Part 3 percentage dip below 80% momentarily, these figures have otherwise remained firmly entrenched in the 80-90% range and have even surpassed 90%. The final average pass rates of all three testing windows compared here landed well above 80%, so it doesn’t look like Part 3 plans to leave that territory any time soon. 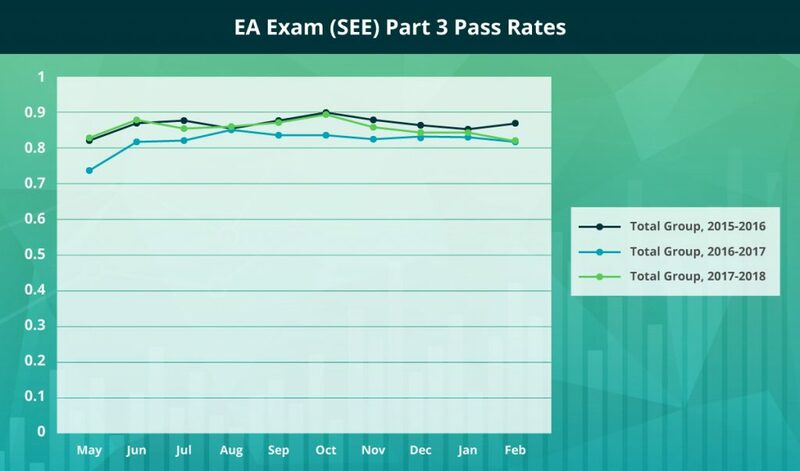 Though Part 1 had the lowest pass rates for the last two years in a row, its pass rates have reached similar heights as those of Part 3 in the past. Part 2 has had the lowest pass rates for the decade. Part 3 has had the highest pass rates, and Part 1 has experienced the most pass rate fluctuation in the past ten years. One significant influence on pass rates is the order in which candidates take the exam. Many candidates start with Part 1, and because they are unfamiliar with the exam, they don’t pass on their first attempt. This may explain the low Part 1 pass rates. The popular choice to take Part 3 last also accounts for the high Part 3 pass rates. Part 3 contains topics requiring knowledge of topics tested in Part 1 and Part 2, so the candidates who have already passed these parts are well prepared to pass Part 3. Another major influence is candidate preparation. Though the pass rates are high, the exam is not easy, and the only way you can pass is to study well for several months. The best way to ensure that your studies will be effective is to stick to a EA review course program. When you rely on the best EA review material to learn the exam content, you can be completely prepared by exam day and pass on your first try. Gleim EA Review is the most widely-used exam prep, having trained more enrolled agents to pass the exam than any other provider. We have everything you need to excel on the EA exam whatever the pass rates may be. Exam changes can also impact the pass rates. When the next testing window opens on May 1, 2019, the EA exam will test candidates on the Tax Cuts and Jobs Act, which was signed into law in December 2017. However, this significant exam change does not have to affect your chance at EA exam success. When the exam changes come, Gleim EA Review will still be here for you, and our updated course will cover all of the new exam content. We recommend that you sit for the EA exam before the current testing window closes, as you still have time to pass all three parts and avoid the changes. However, no matter when you sit for the EA exam, you can count on Gleim EA Review to prepare you to pass. Information about pass rates and exam changes can help you know what to expect and how to plan, but it should not worry you. With our expert support and the biggest test bank available, Gleim EA Review will guide you to a winning EA exam performance. Learn everything you need to know about the exam and how Gleim can help you pass by accessing our free EA exam guide today!